As David Cameron defends the government’s new caps on skilled immigration to Britain, it is important to consider what impact these caps will have on public attitudes to immigration. Will they alleviate public concerns? On the basis of my work on the subject, I think it’s very unlikely. First, evidence is accumulating that numbers don’t matter that much. That is, the actual number of immigrants in a country is largely unrelated to public hostility to immigration. Given that Cameron’s cap is unlikely to have much impact on these numbers (see here for example) it is difficult to imagine that the public will perceive much change. People generally misperceive the numbers anyway, usually overestimating the number of newcomers. It is perceptions of immigration that matter more than reality – and Cameron’s tweaking is unlikely to make much difference to these perceptions. Second, given the types of concerns people have about immigration, these are unlikely to be affected by minor changes to levels of skilled migrants. One such concern is related to the economic threat posed by immigration: people may perceive that they are in direct competition with migrants for jobs and/or imagine migrants are a drain on social services. But to what extent does this apply to skilled migrants? Are there any British citizens competing with skilled migrants? If so, why has the demand for skilled migrant labour been so high? And in terms of social services—although the statistics are unclear—it appears that at worst the effect of these migrants on social services is neutral because they either work in the social services themselves and/or pay British taxes and so help finance those services. However, the main concern that people have about immigration is not economic. They fear new migrants will not ‘fit in’ with the ‘British way of doing things’ or will reject ‘British values’. 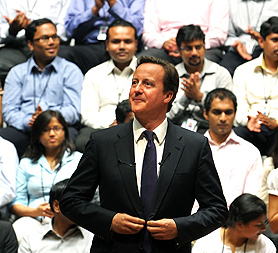 It is unclear how Cameron’s proposed changes will have any impact here. Rather than adopting a policy which is likely to have a limited impact on public attitudes, the government should instead face the fact that Britain is already host to millions of migrants and will continue to receive substantial numbers of immigrants even with these caps in place. Ministers should then pursue policies to help reduce public concerns. For instance, we know that friendships with immigrants and minorities can have a significant impact on opinions about these groups. We also know that such friendships do not come about that naturally. Policies which actively promote this type of contact may, therefore, help to make a substantial dent in negative perceptions of immigrants, and thus help increase social cohesion. In addition, although the numbers of people facing realistic economic competition from new migrants appears to be very small, these concerns do exist for a significant portion. Government should engage in a more meaningful way with this group, particularly those living in Britain’s most deprived areas. In such places immigration has become entwined with a more general dissatisfaction, particularly where long-term unemployment prevails. While social benefits have kept people housed and fed, nothing has replaced the lost sense of identity that work once gave the unemployed. Too little has also been done to improve their employment prospects. Finally, higher education has a substantial impact on perceptions. So policies that make it more difficult for citizens to enter higher education are likely to reduce the pool of people whose outlook on minority groups might otherwise have been changed. In that regard, raising tuition fees may have a negative impact on social cohesion. In short, David Camneron’s proposed change to the numbers of skilled migrants is unlikely to alter perceptions of immigration very much. Closing the door to immigration will have a limited impact on overall numbers and an even more limited impact on public concerns. If the government was really interested in tackling the undoubted problem of perception it needs to consider an alternative approach. But the kind of policies mapped out above do not have the same kind of immediate impact on the headlines as does a carefully crafted speech delivered a few weeks before the local elections. Previous Post Northern Ireland: time for normal politics? Next Post The New British Fascism? I agree that restrictive politics on immigration is not very helpful these days. Interestingly, the majority of European countries came to this conclusion in the mid-1990s. Besides, there is an interesting, yet predictable paradox which the government does not consider. Favouring skilled migration will in fact increase migration generally. For instance, levels of skills and education within a migrant family differs. Therefore, welcoming one skilled migrant the government accept his/her less skilfull dependants either.